A few of weeks ago, a co-worker and I ended up exploring the new area of Bonifacio High Street Central to check and see the new places that opened in the area. We looked at the various menus on display outside the restaurants. As we turned to see Cake Club’s menu, there was an item that caught my attention: Foie Gras Macaron (P150). The thought of foie gras turned into a dessert didn’t put me off completely, it excited me. 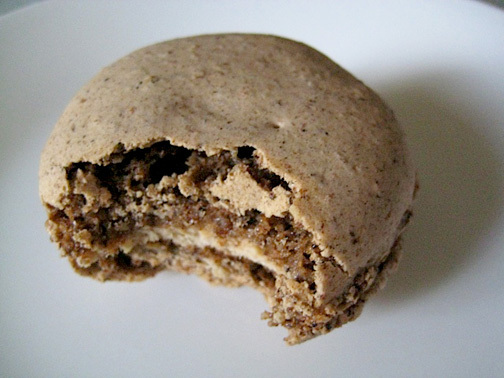 I’ve read about Pierre Herme’s macarons before and he created one with foie gras and chocolate. I must admit I haven’t the chance to try a macaron from Pierre Herme and not much of a macaron fan but I am very open to try something different. I learned that the macaron is available exclusively at Cake Club’s BHS location every Saturday and Sunday. One fine Saturday, I placed a reservation for 2 macarons. I bought 2 because I wanted to eat one fresh, and the other for my greedy self to enjoy at home the next day. The foie gras macaron is decadent. At first bite, it’s sweet but as you chew the foie gras creeps up into the palate and WOW… words cannot describe this so I had to share it with my friend and let her enjoy the experience as well. One of the staff, Jhoe, explained that the crisp shell is made with porcini mushrooms. No wonder it worked so well together. I asked Jhoe if there was any chance that they were going to make the ice cream version of it, he just laughed at it but I thought it would be a genius creation. The other macaron I took home was still good up to the next day, just be sure to refrigerate it well. I shared the other one with my cousin, it felt like this was something people in Manila should try at least once. **Special orders for the foie gras macaron are welcome, just place the orders 3 days in advance. wow!!! gotta get me to cake club!!! I'm going to ask my husband to make this for me for my birthday! For now, will try the Cake Club version. Can't wait for Saturday! Cutie, tell me if you like it! Darkbutterchew, thanks for dropping by and hope you like the macaron!